I’ve done my fair share of presentations through the years, I’ve shed blood, sweat and tears from my hours working in PowerPoint that it should warrant me access to heaven about now. I’ve also been on the receiving end of numerous PowerPoint presentations, and I know the feeling of “death by PowerPoint” from that angle as well. If you are lucky enough to get a meeting with someone, then I’m of the opinion that I’m there to make a connection and hopefully sow the seeds for a professional relationship. 2. What is the shortest possible way you can create a story that takes you to the end goal/solution? 3. Collect all the information you need outside PowerPoint – copy, images etc. 4. Do an analog version, take a piece of paper and sketch a simple version of the contents before you disappear into the PowerPoint madness. 5. If you don’t have a branded already set up template for your company – try at least to use the same fonts, colours etc as your company profile to keep it consistent as well as make a professional impression. Within digital services and design, this is important. 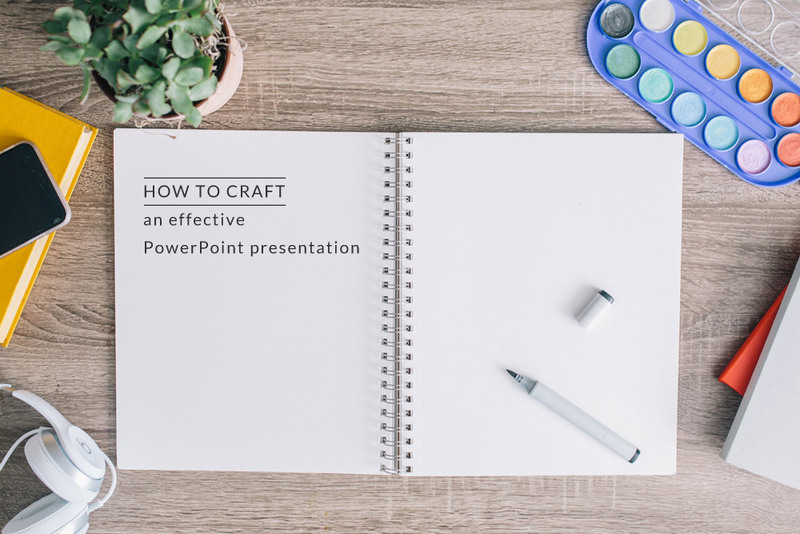 But also because if you craft a clever presentation, which explains something complex or a solution to a challenge, the presentation will get handed on within organisations or between companies. So this can actually be a really important piece of marketing material for your company if utilised to its full potential. 6. Always put your company info last, the focus should be straight from the start on how you solve the challenge for your possible client or fit what they are looking for in relation to something tangible. 7. Less is more, rather add text to the annotation notes, which are not visible when in presenting mode, rather then on a slide itself. It someone asks for them, you can always hand it to them later. 8. Remove any clutter. And limit your usage of images on a slide to one or possible two if you have to. 9. Use large photographs to lighten up the presentation. 10. Let the presentation rest between sessions. Your brain stops reading typeOs after you’ve read a text three times. So rather then sit an work with a presentation intensely, take a break. And print it out, it will help you spot errors. 11. Don’t use clashing colours, that will cause hypnotise your audience, nor contrast colours and backgrounds for text. And for gods sake, remove that automatic drop shadow. Again less is more. 12. If your presentation is very heavy on statistics, create infographics. This is my template that I always go back to, in terms of creating presentations. I adapt it to suit the specific scenarion I’m creating the presentation for. 1. The purpose – why we are here: describe why you are in the room with these people having this meeting, is it a brief, a reply to a pitch? to discuss new ideas? 2. The solution/answer – break it down (if you can, and add any statistics an insights to prove your point, if applicable). 3. How – what is required to get there? 4. Next steps – how to get there, with clear steps. 5. Timeline – how log will it take? 6. Investments – what budget are required? 7. Credentials – add company information that will add weight to why are the right person/company to do the work/help the client. 8. Your contact details and your responsibility. I recommend reading The Jelly Effect by Andy Bounds – its my go to source for fine-tuning my presentations.